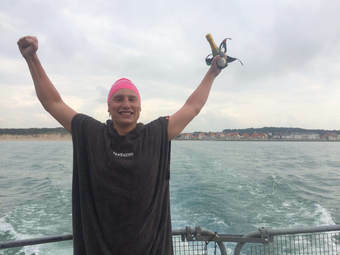 Physio Remedies client Toby Davis planned to swim The English Channel at the end of July in aid of The Cystic Fibrosis Trust but the weather wasn't playing ball during his window. However, he did eventually get the call to swim and his Channel Swim Report follows. After a frustrating two week wait for the weather, at 11pm on Monday 7th August I finally lowered myself off the boat and walked up Shakespeare Beach (just around the corner from Dover Harbour) to clear the water feeling calm and relaxed, reminding myself to enjoy what might well be a once in a lifetime experience. Then the klaxon sounded to signal the start of my 21 mile channel swim from England to France and we were off - I dived in and swam out to my boat SUVA's spotlight in the water, which I would use as a marker over the next 6 hours of darkness. That first few minutes were exhilarating but I managed to control the adrenaline and settle into a decent rhythm fairly quickly. I fed every hour and my first feed was very quick - a quick roll onto my back, down the carb drink and confirm to my crew that I felt good, then off again. About 15 seconds, which was the plan. Over the whole swim it turned out my longest feed was 40 seconds and average time about 20 secs which I was very pleased with. After the first feed the next 2.5 hours flew by and I knew it was going well. Swimming in the dark was fun, it gave me the opportunity to solely focus on getting my stroke right and making sure I was enjoying the swim as planned. Around hour 4 it started to feel a bit more of an effort and, when I stopped for a feed I realised why - suddenly where before I had been floating on my back next to the boat, now when I did that I had to kick furiously just to stay alongside. That brought home just how strong the tide I was swimming in was, and ended any over optimistic thoughts in my head about the possibility of making it across in a super quick time. Around this time I also got some jellyfish stings to my back, legs, shoulder and most interestingly across my mouth and nose - I didn't really mind these actually, they were a bit like an extra strong stinging nettle and helped jolt me out of any autopilot swimming. Around 5:30am we were treated to the most amazing sunrise which brought the darkness section of my swim to a dramatic end. To witness that from sea level in the middle of the channel was truly spectacular. I am a very dark shadow in the foreground in this one but quite rightly the sunrise takes centre stage! I swam steadily and pretty comfortably until the 11th hour when my crew told me they needed a big push in terms of effort. So I sprinted at 100% for an hour, which felt like forever. The fascinating thing was that, despite having swum for 10 hours already, every time my brain told me I needed to slow down I could override it and just kick harder. Unfortunately the spring tide turned out to be too strong for me to fight across it and hit land at Cap Gris Nez, which tends to be the fastest place to end a crossing. So I found myself being swept up the coast by a strong turned tide, which meant the sprinting had to continue as I tried to fight far enough through it to hit land. Around hour 13 I got frustrated as France had seemingly disappeared from view (it was actually hiding behind the boat on my right as I got swept north past the Cap) and I asked for a marker to give me an idea of how close I was. Neil my pilot told me I was deep into French inshore waters, and shortly after that the coast came into view again seemingly within touching distance. Despite being no more than a couple of kilometres out, I spent another 2 hours pushing across the tide to get in - that time actually went quite quickly as I knew that I would get in eventually and that it was just a matter of time. I had to stop myself celebrating in my head though as I knew lots of swimmers still failed to hit the shore from that close. But finally I got close enough to see the houses and beach on the shoreline and knew I was swimming into Wissant. The last 20 mins were pretty special, just making the most of the experience and thinking about all of the people who had supported me through the months and months of training. It got slightly emotional. I could walk up the last 50 metres and had a great time running and jumping through the waves to stand clear of the water for the klaxon to sound the end of the swim after a total of 15 hours 04 minutes! It felt incredible to have finished the swim and even better that physically I still felt pretty good. I could easily lift my arms above my head and hold up my 4 month old in celebration once we got back to Dover, which I think is a good result! I was back in the water (with pain free shoulders) within 2 days which was a huge bonus and a ringing endorsement for Ray Gibbs' coaching and the technique work he has done with me, as well as the excellent physio I had received in advance of the swim from Sarah Lawson at Physio Remedies. Now to relax a bit and work on my future swim bucket list with a cold drink in hand! Toby's Channel Swim has raised over £10,000 to date. If you're as impressed as we are at Toby's feat, you can donate to The Cystic Fibrosis Trust via his Just Giving page. Words and images by Toby Davis.